The destiny of the North American continent, and with it the very history of the United States, changed by events that took place on September 29, 1565 on what is now Florida's northeast coast. On that day, the first of two seemingly minor skirmishes took place between the nations of France and Spain. Although these encounters occurred two weeks apart, the outcome of each was the same—French soldiers lost their lives at the hands of Spanish soldiers. Approximately 245 Frenchmen were killed; the area was thereafter known as Matanzas, the Spanish word for slaughters. Four years later, the first of many wooden watch towers was constructed near the site. These towers would stand as witness to many strange and interesting events, including attacks by pirates and the approach of starving shipwreck survivors. These stories and more are a part of the fascinating history of Fort Matanzas National Monument. St. Augustine was once an integral part of Spain's plan to control and dominate the greatest powers of Europe. 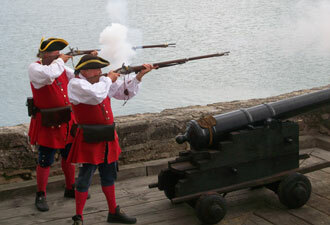 The city's main defense was provided by the massive fort called Castillo de San Marcos, today a national monument. Additional fortifications added to the town's defense. 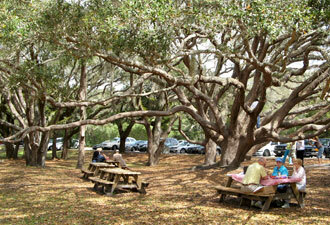 The most important of these was Fort Matanzas, 14 miles south of the town. 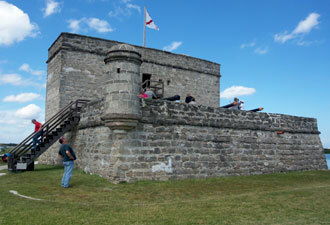 The fort was built using a native stone called coquina. This sedimentary limestone's main component is the shells of long-dead mollusks. Constructed between 1740 and 1742, Fort Matanzas was designed to prevent enemies from using the area's natural waterway as an attack route to the town. Over time political conditions changed. Spain, once a world superpower, became economically and militarily unable to maintain its distant and expensive colonies. Sold to the United States in 1821, Florida became a territory of the young nation, forts and all. Today Fort Matanzas National Monument provides a natural setting to explore and get a sense of what was once the very edge of the map. The park's nearly 300 acres preserve more than history. A mile of park beach provides protection where endangered and threatened sea turtles nest in the summer. Turtles dig nests on the park's shore and lay their eggs at night from May to September. Sand dunes shelter animals including the Anastasia Island beach mouse, a federally listed endangered species. Situated in the middle of the Atlantic Flyway, birders can see endangered and threatened species, including numerous shorebirds. The park is home to one of the largest beach nesting colonies of least terns on the east coast of Florida. History or nature, dry land or blue waters, when it comes to having something for everyone Fort Matanzas National Monument is a great place to visit. The park is open from 9 am to 5:30 pm daily, 364 days a year. A passenger ferry to the fort departs every hour at half past the hour from 9:30 am to 4:30 pm, weather permitting. Come and see for yourself all that the park has to offer.